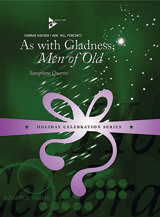 The lyrics for 'As with Gladness Men of Old' were written by Englishman William Dix (1837--1898) in the 1860s, reportedly on the day of the Epiphany while Dix was sick in bed. The tune was included in a collection of German chorales edited by Conrad Kocher and published in the 1830s. As a testimony to the flexibility of such music, the hymn is also sung during Thanksgiving under the title 'For the Beauty of the Earth.' This arrangement for saxophone quartet (SATBar)---rather than favoring a soprano solo with accompaniment---strives to include all of the players in the music making, particularly by distributing the melodic material. All dynamics and articulations, minimally marked, should be taken as suggestions only, as performers are encouraged to make their own interpretations.